The Most Whimsical Hotels in Washington D.C. The Swankiest Hotels in Washington D.C. The Best Pet Friendly Hotels in Washington D.C. The Best Hotel Rooftop Bars in Washington D.C. The Best Hotel Bars in Washington D.C. 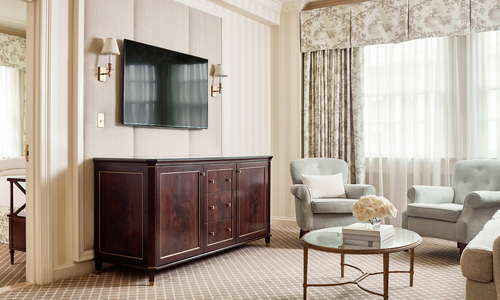 The Capital City’s hotel scene befits Washington’s image as a world-class destination. With so much variety in lodging, the city has something for everyone, from historic properties to modern designer hotels to urban inns. You can pick your hotel based on the type of experience you set out to have when you arrive. If you are seeking an experience steeped in pomp and circumstance consider one of the city’s grand hotels: the Jefferson, the Hay-Adams, the Fairfax at Embassy Row, the Willard, the Mayflower, or the St. Regis, to name but a few. When you check in at any of these beautifully kept and storied properties, it is near impossible to forget the rich history that defines D.C. If you prefer a more urban vibe, you have a variety of choices: from Hotel George, Hotel Monaco, and Topaz Hotel to contemporary inside-the-Beltway gems like the Palomar, Hotel Rouge, the W, and the Dupont Circle Hotel. For a more traditional hotel experience consider checking into a first-rate chain located in strategic locations throughout the city and beyond. Visitors in search of more intimate lodging may do well to cross the threshold at one of the city's many bed-and-breakfasts. The Swann House and Akwaaba DC offer exceptional, personalized service, art-filled guest rooms, and the pleasure of waking up to a home-cooked morning meal. Over the years, the Embassy Circle Guest House and the Woodley Park Guest House have been welcoming guests time and again for good reason.